What Divi has to offer is a supremely quick and usable network, drastically lowering the cost of entry into the crypto space. The combination of a user-friendly and fast transactions poses to be something sorely needed in the crypto space. Although some key features are still in development, devs frequently provide updates and are generally quite active. It would be foolish to say that investing in, or at the very least, taking a serious look at Divi would be unwarranted. ​Recent updates are always promising with the newest bringing some welcome news. As of 5APR2019, Divi’s test network is now live, testing key features such as Atomic swaps, HTLCs, SegWit, and the Lightning network. Users can now run Divi nodes on Raspberry Pi machines for any multitude of reasons. Another welcome bit of news is the recent partnership with a cloud staking service, My Container. ​ My Container is a great service that fits with the goals set forward by Divi. 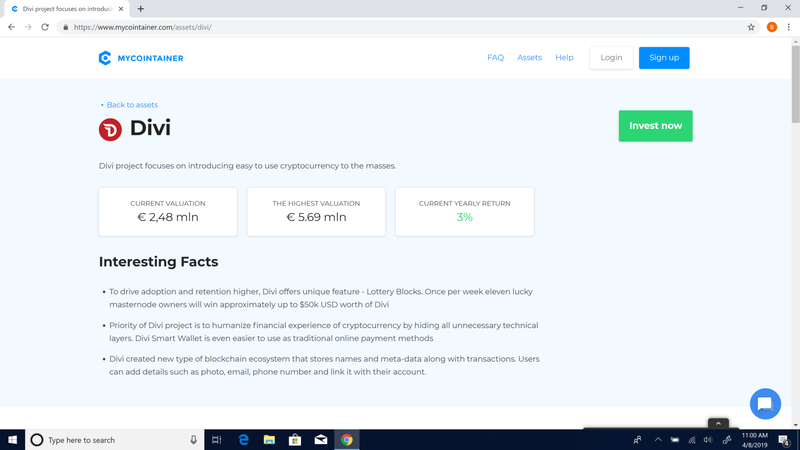 Where Divi is a coin that offers the easiest possible end user experience, My Container is a service that allows for the easiest possible experience for anyone looking to start generating profits from their coin holdings. Essentially, My Container will hold your coins, set up masternodes, and stake coins for the user, taking only a low fee to do so. A similar service is offered on Vinex exchange, were if a user has 10,000 DIVI or more, the exchange will stake the coins for you and will send weekly emails on how much has been earnt. In fact these two are the tip of the iceberg when it comes to alternative means of earning DIVI. ​Perhaps the most interesting way someone can purchase DIVI, so long as they are not a U.S. resident, is by credit card on CryptoWolf. Up to $1000 dollars’ worth of DIVI can be purchased at a single time and there is a 12% commission rate, but it is still both convenient and a pretty novel way to purchase an alt-coin. CryptoWolf also offers a swapping service, allowing users to swap many other tokens direct for DIVI, at only a 0.5% fee. 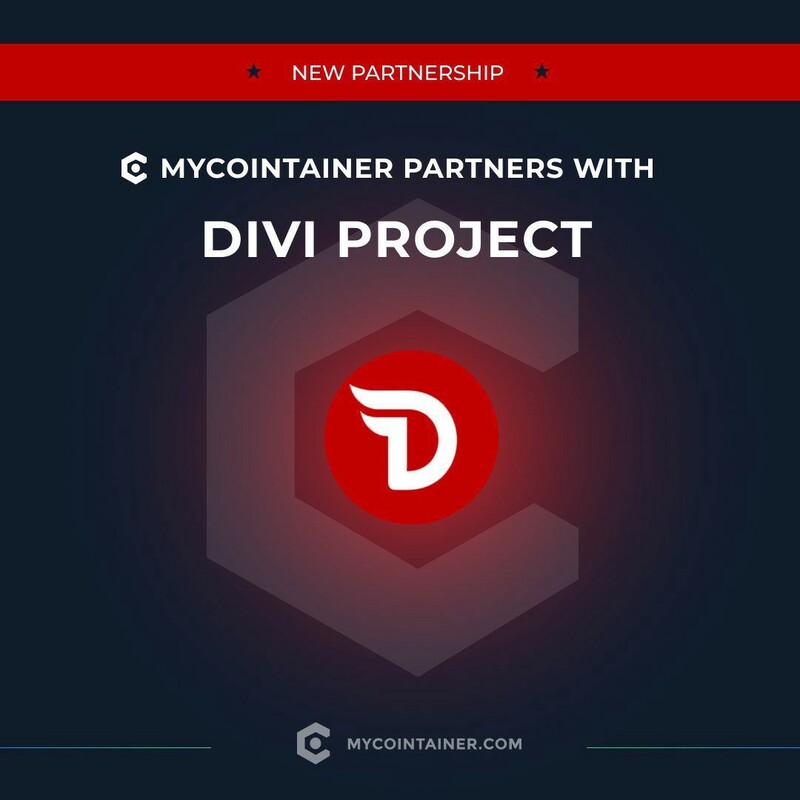 Naturally Divi is not present only on CryptoWolf and a full list of exchanges can be found here: https://wiki.diviproject.org/#exchanges. ​As it stands, Divi is a project that needs to be watched carefully, as it offers so much for investors. A coin for the masses is something that is sorely needed, as many people find crypto confusing, therefore not for them. With Divi’s continued development and vision, hopefully that will change. With these most recent updates and services offered, you can see this philosophy in action, with easy-to-use and convince features on tap. Investing in Divi currently is a very sound move, both financially and in the effort required-what more could you ask for.